This very large one bedroom suite, suitable for two people, is situated on two floors. This Suite is accessed via 12 cut stone steps to the rear of the House. The entrance hall opens onto the large living room. All of the rooms have excellent views over the gardens to the bay. The stairs in the Living Room lead you up to the Bedroom, with its super king-size bed (also available as a twin room). 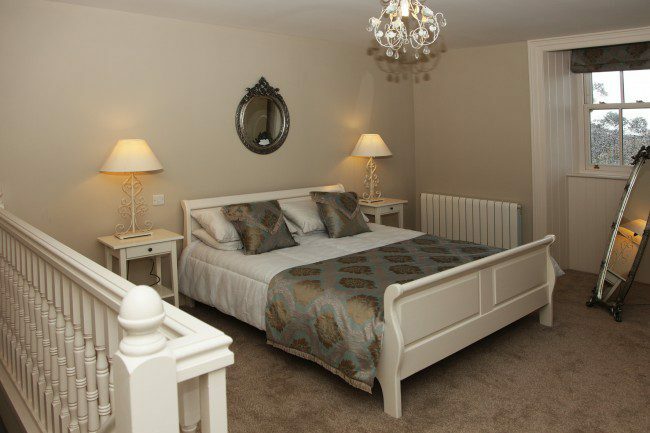 This is the highest room at Kells and enjoys three different aspects of the gardens and bay. The bathroom is situated on the 1st floor. Nightly Suite Rate €145, full breakfast is available as an optional extra in the main house. This apartment is for up to two people.